The invention relates to a radiocommunication device (FG) comprising a display unit (AE) and means for wireless connection to a radio network, especially a cellular radio network. According to the invention, first means are provided for mechanical and electrical coupling of a digital camera (DK). The pictures supplied by a lens (OB) of said camera (DK) can be transmitted to the radio network. The present invention relates to the use of diglycolic silicates as crosslinkers in the preparation of carboxyl-containing hydrogels having improved properties, and the use of the hydrogels thus prepared as so-called. Superabsorbents for absorbing aqueous fluids. Superabsorbents are water-insoluble, cross-linked carboxyl-containing polymers which are capable of swelling and formation of hydrogels aqueous liquids and body fluids, absorb such as urine or blood, and to retain the absorbed liquid amount under a certain pressure back. They are also referred to as superabsorbent polymers or SAP. 4. reactive crosslinking by dehydration. A typical example of a network with a reactive compound ringöffenden teaches EP-A 0 317 106 by the use of polyglycidyl ethers such as ethylene glycol diglycidyl ether and EP-A-0,618,005 with the use of Polyazetidiniumsalzen. According to DE-A-4020780 an improved absorption is achieved under pressure by surface-cross-treatment of a polymer with 0.1 to 5 wt .-% alkylene carbonate. US-A-4,666,983 teaches the use of diisocyanates and poly- isocyanates as candidates for post-crosslinking of SAP surfaces. By reaction with hydroxyl groups thereby Carbamatstrukturen arise. Another way of networking is the formation of ionic instead of covalent crosslinking points. According to EP-A-0372981 polyvalent metal ions such as aluminum for the ionic crosslinking of the carboxy functions are suitable. WO-A-94/09043 describes the use of polyhydroxy compounds, in particular organic polyhydroxy compounds such as diethylene glycol or trimethylol propane at elevated temperature under Esterbildung. EP-A-0610013 describes organic esters of carboxyl compounds of a polyfunctional organic Alhohols, where also an only partial esterification of the hydroxyl groups is described. The esters can in this case be applied to the SA -surface also in a mixture with water or an organic solvent. EP-A-0644207 describes the surface crosslinking (by use of a blowing agent) porous SAP with polyhydroxy compounds. The crosslinking reaction, however, is completely analogous to WO-A-94/09043, the difference is only in the base polymer prior to the surface. EP-A-0509708 teaches the use of mixtures of a poly hydroxy compound characterized by an HLB-value between 3 and 10. The surfactant does not add to the reaction at but facilitates the distribution of the polyhydroxy component on the surface with a surfactant, , Crosslinking with certain polyfunctional organic alcohols is disclosed also by EP-A-0450924. As pointed out in EP-A-0610013, the encryption have drive according to points 1-3 some drawbacks. The selected from these groups cross-linking agents exhibit a very high reactivity and they react immediately upon application to the polymer to be crosslinked. This high reactivity is very detrimental to a uniform distribution on the surface. This disadvantage can not be compensated by an increased mixing time. The performance properties are not optimal due to this lack of distribution on the surface. The cross-linking only with ionic groups is very difficult, since the diffusion of multivalent ions begin during the application to the SAP particles, and thus instead of a crosslinking Oberflachen- a stronger gel crosslinking is achieved, which does not have any beneficial application properties. In contrast, the use of organic alcohols or esters thereof does not lead to dehydration networking to point 4 to these disadvantages. Because of the reduced reactivity against the polyglycidyl ethers of a uniform distribution in a mixing time on the surface of the SAP is possible. This can be done a uniform surface post, where you can also control the depth of penetration into the SAP grain on the mixing time and the solution conditions. However, the use of alkylene carbonates or less reactive poly ols has the disadvantage that one has to crosslink at very high temperatures in order to obtain sufficient reactivity. At such high temperatures can be established a thermal post-crosslinking of the whole polymer, the centrifuge retention is adversely affected. The high temperatures can still result in an undesirable thermal decomposition of the product, which leads to a discoloration of the product. The primary binding is carried out by through the reactive group X, the hydrolyzable group is reacted in the presence of water to the silanol group which in turn may form in a further step by a dehydration a Si-O-Si bond. However, there is no disclosure of compounds that consist only of hydrolyzable groups. Object of the present invention is to provide a novel process for surface-crosslinking, by the hydrogels with improved properties in terms of gel strength and Wasserrüc - are obtained stamina. In this case, the crosslinking agents should have an average reactivity which permits a distribution of the system used on the surface, without having to have the disadvantage to crosslink only at very high temperatures. Surprisingly, it was found that at a Oberflächenver - networking obtained with Diglykolsilikaten superabsorbent polymers with the required properties. wherein R and R 'are independently from each other or equal and serstoff water or denote Ci-Cg-alkyl. In formula (1), R and R 'are preferably the same meaning and are in particular each represent H or CH 3. The crosslinking reaction is generally carried out by transesterification in the range of higher temperatures. The crosslinking reaction can be accelerated by a catalyst, whereby it can be carried out at lower temperature. Temperatures of 120 to 220 ° C are preferred for the inventive process. The crosslinking is preferably carried out by transesterification of the compounds of formula 1 by ring opening with the reactive carboxyl groups of the monomers or the (co) poly older. The compounds of formula 1 are preferably used in amounts of 0.05 to 10 wt .-%, based on the Gesamtmonomerengewicht, or the total polymer weight. Preferably, they are used in the form of aqueous, alcoholic or aqueous-alcoholic mixtures. Suitable crosslinkable with compounds of formula 1 according to the invention to hydrogels natural polymers can be used in both unrefined and refined in shape. Particularly suitable are especially carboxymethylpolysaccharides such as carboxymethylhydroxypropyl guar, carboxymethyl - starch and alginates. As a copolymerizable hydrophilic monomers particularly acrylic acid, methacrylic acid, crotonic acid, 2-acrylamido-2-methyl- propanesulfonic acid and come -phosphonic acid, vinylphosphonic acid, vinyl phosphonic acid, salts thereof, acrylamide, N-vinylamides, vinyl acetate or mixtures thereof in question. Especially preferred is the use of acrylic acid and its salts, for example Na, K and / or ammonium acrylate is. The polymerization can be carried out by any known reaction, is preferably a free-radical polymerization in homogeneous phase, for example in aqueous solution, a so-called. Gel polymerization. Other possibilities for the synthesis of the hydrogels according to the invention offers the precipitation from organic solvents such as for example alcohols, preferably tert. Butanol, or hydrocarbons, such as hexane or cyclohexane, or suspension, dispersion, emulsion or Mikroemulsionspoly- polymerization, but also the ionic polymerization. H 2 S 0 8, H0 or azodiisobutyronitrile. Redox systems are very useful as polymerization initiators. The polymerization can be triggered by high-energy radiation. The compounds of formula 1 can be used for crosslinking during the polymerization reaction and / or mers after the polymerization reaction for the subsequent crosslinking of the poly. The compound of formula polymeric until an uncrosslinked Pr (Co) was added 1, this is generally done before the drying by homogeneously mixing, for example by kneading an aqueous polymer gel in a kneader. Also spray from dilute solution to a polymer powder or polymer granules is possible. In this case, a selective crosslinking of the polymers can be carried out in the vicinity of the particle surface by a suitable choice of the solvent system. The hydrogels of the invention are very useful as absorbents for aqueous liquids, the formulation of cosmetic preparation as strengtheners and / or binder of the reactive group-containing, fibrous sheet materials as polymeric additives for aqueous drilling fluids and cement additives in oil production, as well as for use in hygiene articles , packaging materials and nonwovens. Hydrogels according to the invention on the basis of carboxyl-containing polysaccharides are suitable for use as an SAP in an excellent manner. By post-crosslinking, in particular on the surface with compounds of formula 1 have already been pre-crosslinked polymers that are intended for use as an SAP, the effectiveness of absorption can be significantly improved in under pressure. The addition of acid catalysts which Vernetzungsreak- tion can be accelerated and / or the reaction temperature will lowered. Compounds which are suitable as catalysts in the present process, inorganic oxo acids, their acidic salts, and anhydrides, esters or Teilester such as acid phosphoric acid, sulfuric acid, boric acid, polyphosphates, polyborates, poly- phosphonates, phosphonic, and hydrogen sulfates, hydrogen phosphates , Also suitable are where X may be a halogen acids of the general formula HX, as well as all of the known Lewis acids such as BF-etherate or sulfonic acids, in particular organic sulfonic acid, such as p-toluenesulfonic acid. Particularly suitable are hydrogen phosphates, boric acid and their anhydrides, esters or Teilester, sowei p-toluenesulfonic acid and BF 3 etherate. Preferably 0.05 to 3 wt .-% of catalyst, based on the weight of the polymer, is added. For the characterization of superabsorbent polymers are certain test methods used, this includes the measurement of extractables after n hours and the absorption of 0.9 wt .-% NaCl solution with and without weight load. 1 g of SAP is dissolved in 200 ml of 0.9 wt .-% NaCl solution and with a magnetic stirrer for n (n = 1-16) stirred for hours. The supernatant solution is filtered and the polyacrylic acid or the poly-acrylate is titrated. The pH electrode is calibrated for the titration at pH 2, 7 and 10. FIG. It is initially titrated with about 0.1 N NaOH to a pH 10th The consumed amount of NaOH is referred to as Va (in ml), the normality of the base with Na (n meq / ml). The thus-titrated solution is then adjusted to pH 2.7 using about 0.1 N HC1. The consumed amount of HC1 loading to draw than Vb, the normality of the acid with Nb (in meq / ml). The same procedure is repeated with 0.9 wt .-% NaCl solution to determine the blank value of the titration. Here, Vab is the required amount of base, Vbb the required amount of acid for the titration of pure saline. In the absorption under pressure 0.9 g of SAP is distributed evenly on the bottom of a Plexiglas cylinder. The cylinder has a height of 50 mm and an inner diameter of 60 mm. On the bottom of the cylinder is a wire mesh with a 36 micron mesh (400 mesh). OB over the superabsorbent is applied a covering plate, and the sample with a respective weight (20, 40, 60 g / cm 2) load. After that allows you to swell the superabsorbent for 60 minutes under the appropriate pressure. The shear modulus is measured using a Carri-Med controlled stress rheometer. For measurement, a 6 cm plate-plate geometry is used. For the determination of the shear modulus is allowed to 2.5 g SAP in 100 g of 0.9 wt .-% NaCl swell for 24 hours and then measures the shear modulus as a function of frequency. The value at 10 Hz is specified as a memory module. In Examples 1 and 2 is the use of the compound of formula 1, in the mean R = R '= H or CH 3, described as crosslinkers during the polymerization reaction. and 10 g of sodium Diisooctylsulfosuccinates (Rewopol ® V 2133 from Rewo, Steinau) and 2.5 g of N, N-methylenebisacrylamide was added. At a temperature of 4 ° C, the initiators, a redox system consisting of 2.2 g of 2, 2 'are -Azobisamidinopropan- dihydrochloride, dissolved in 20 g of deionized water, 4 g of peroxodisulfate potassium permanganate dissolved in 150 g of demineralized water and 0 , 4 g of ascorbic acid dissolved in 20 g of deionized water were added successively and stirred. The reaction solution is then left to stand without stirring, wherein a solid gel is formed ensuing polymerization, the temperature to about 89 ° C increases in the course. This is then mechanically comminuted, dried at temperatures above 150 ° C and ground. The procedure of Example 1, except that now 6.0 g of compound 3 (= compound 1, wherein R = R '= CH 3) was used. Also 5, the resulting product here is well suited for use in baby diapers and is characterized by good liquid - keitsretention and distribution. 25 gels are with 56.5 g sodium hydroxide solution (50%) was added (neutralization degree of acrylic acid 74 mole%), kneaded twice with 25 g of a 1% solution of the compound 2 was added, again kneaded twice, then at temperatures above 150 dried ° C in a thin layer, ground and sieved. Extractables (1 h value) of 2.1%, 35 absorption under pressure (20 g / cm 2) = 20 AUL = 29.9 g / g.
Under adiabatic conditions in 2574 g are placed at 15 ° C cooled deionized water in a 1.5 1 40 see cylindrical wide-neck reaction flask and 510 g acrylic acid and 1.52 g triallyl amine dissolved therein. It is introduced into the monomer solution (about 2 1 / min. For about 20 min. ), To lower the oxygen content nitrogen. At a content of 1.5 ppm 0 7.7 g of a 45 10% aqueous solution of 2, 2-azobis (2-amidinopropane) are - dihydrochloride are added, after a further N -Einleiten 0 and a content of 1, 3 ppm to 2.6 g of a 1% strength H0 2 solution conces- give 11 and finally at a content of 1.0 ppm 0 6.4 g of a 0.1% strength ascorbic acid solution are added. By the onset of polymerization, the temperature to about 65 ° C increases in the course of which a solid gel which is then comminuted mechanically. After drying this gel Comparative Product Table I (gel 4a) is obtained. 4a 30% polymer gel from Example 1 0.26 g of a compound in which R = R '= CH 3, dissolved in 40 ml of methanol were added, homogeneously kneaded, crushed, at 180 ° C to a residual moisture content of 3% dried, ground and sieved. The so-wonnene gel is referred to as Example 4b by surface postcrosslinking. The following examples show the effect of the surface post-invention of a particulate system with carboxyl or carboxylate groups. The increase in absorption under pressure load is documented in Table I below. To 300 g of a crushed to 73 mol% neutralized 30% polymer gel of Example 4a, 0.51 g of compound 3 (= compound 1 with R = R '= CH 3), giving dissolved in 40 ml of methanol, homogeneous kneaded, crushed, dried at 180 ° C to a residual moisture content of 3%, ground and sieved. are added to 300 g of a crushed to 73 mol% neutralized 30% polymer gel from Example 4a 0.39 g of the compound 2 dissolved in 40 ml of methanol was added to give homogeneously kneaded, crushed, at 180 ° C to a residual moisture content of 3 % dried, ground and sieved. are added to 300 g of a crushed to 73 mol% of 30% neutralized polymer gel strength of Example 4 0.76 g of compound 2, Ge is dissolved in 40 ml of methanol to give added, homogeneously kneaded, comminuted kleinert 12, at 180 ° C to dried to a residual moisture content of 3%, ground and sieved. are added to 300 g of a crushed to 73 mol% neutralized 30% polymer gel of Example 4a 1.2 g of the compound 2 dissolved in 40 ml of methanol was added to give homogeneously kneaded, crushed, at 180 ° C to a residual moisture content of 3 % dried, ground and sieved. Mw> 1 million), made with a degree of neutralization of 53 mol% in the form of a comminuted gel analogously to Example 4 but without the crosslinking agent is 120 g of carboxymethyl and 100 g of 0.15% solution of Compound 2 (Formula 1 where R and R '= H), homogeneously kneaded, crushed, in the air stream at 180 ° C for 15 min. dried, ground and sieved. This gives a water product having a water absorption capacity of more times its own weight. In Examples 11 to 15, the production of water swelling is - cash products with good absorbency by crosslinking of polymers of different origins with the novel compounds described what happens so that mixtures of polyacrylates and Carboxymethylpolysacchariden or alginates slurried in water with compounds of the formula 1 added, homogeneously kneaded, dried in a stream of air at 180 ° C, ground and sieved. 50 wt. -tl. Carboxymethylcellulose, 50 wt. -tl. crosslinked poly acrylate, prepared according to Example 4a, 0.6 wt. -tl. a conjunction of formula 1 wherein R and R '= CH 3. 45 wt. -tl. Carboxymethyl starch, 55 wt. -tl. crosslinked poly acrylate, prepared according to Example 4a, 0.56 wt. -tl. 5 an encryption compound of the formula 1, in the mean R, R '= H.
65 parts by weight Tl alginate, 45 wt. -tl. cross-linked polyacrylate, manufactured 10 is according to Example 4a, 1.8 weight Tl of a compound of formula 1 are wherein R, R 'is CH 3. 15 20 parts by weight Carboxymethyl cellulose, 20 parts by weight Carboxymethl - strength, 60 parts by weight crosslinked polyacrylate prepared according to Example 4a, 1.4 parts by weight a compound of formula 1, in which R = R '= H.
preheated to 30 ° C to 60 ° C, commercially available, partially neutralized, crosslinked polyacrylic acid for use as a superabsorbent in hygiene products are compounds of the formula 1 as a 10% 25 aqueous or aqueous alcoholic solutions added in a mixing unit and at 130 ° C - 200 ° C treated. In Examples 22 to 26 Mixtures of the compounds of formula 1 were used. 30 After cooling to room temperature, the following values ​​listed in Table III, improved compared with the starting product are found. To commercially available partially neutralized, crosslinked polyacrylic acid for use as a superabsorbent, compounds of general formula 1 as an aqueous or aqueous-alcoholic mixtures with addition of 0.1 to 0.6 wt .-%, is added based on polymer of acid catalysts and at 120 ° treated C to 180 ° C. After cooling to room temperature, the following were listed in Table IV led Found ends compared to the starting material improved values. wherein R and R 'are unabh├ñngig another or the same and represent hydrogen or C╬╣-C 6 alkyl. 2. The method according to claim 1, characterized in that it da├ƒ If the superabsorbent polymer is a polyacrylate, is a Carboxymethylpolysaccharid or a mixture of polyacrylates and Carboxymethylpolysacchariden. 3. The method according to claim 1 and / or 2, characterized in that the crosslinking at the da├ƒ Oberfl├ñche of the polymer particles occurs. 4. The method according to one or more of the Anspr├╝che 1 to 3, characterized in that the crosslinking da├ƒ in the temperature range of 120┬░C - is durchgef├╝hrt 220┬░C. 5. The method according to one or more of the Anspr├╝che 1 to 4, characterized in that the crosslinking da├ƒ with addition of acidic catalysts is durchgef├╝hrt. 6. The method according to claim 5, characterized in that the amount of catalyst from 0.05 to 3.0 wt da├ƒ -.%, Based on the polymer betr├ñgt. 7. The method according to one or more of the Anspr├╝che 1 to 6, characterized in that da├ƒ the compounds of formula 1 in the form w├ñ├ƒriger mixtures are applied. 8. The method according to one or more of the Anspr├╝che 1 to 7, characterized in that da├ƒ the compounds of formula 1 as w├ñ├ƒrig-alcoholic mixtures are applied. 9. The method according to one or more of the Anspr├╝che 1 to 7, characterized in that da├ƒ polyacrylates are crosslinked in solid form as powders or granules. 10. 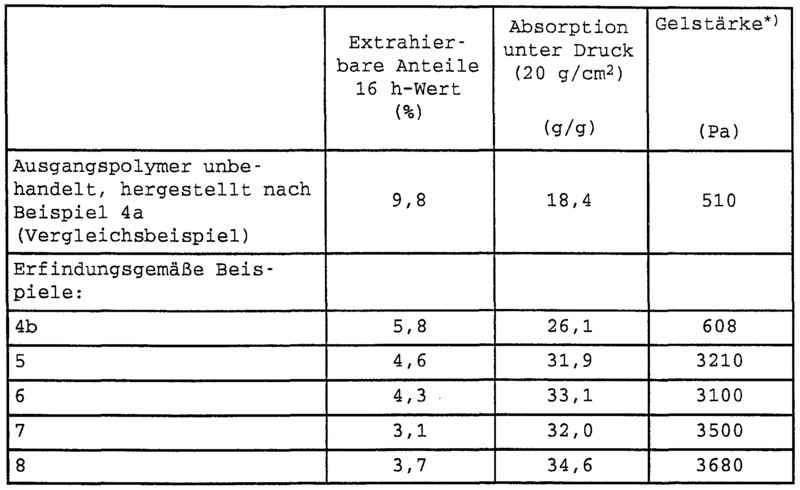 Oberfl├ñchenvernetzte, superabsorbent polymers prepared by the process according to one or more of the Anspr├╝che 1 to 9. 11. Use of the oberfl├ñchenvernetzten superabsorbent polymers according to claim 10 in hygiene articles, packaging materials and nonwovens.